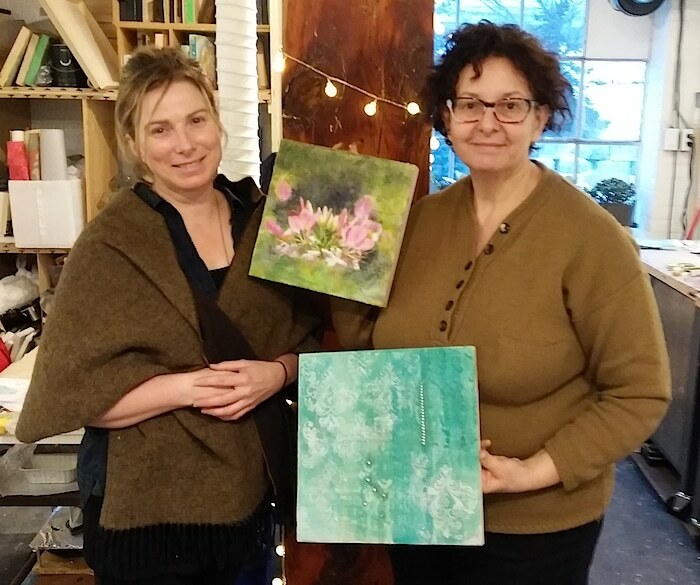 I spent a very happy weekend learning more encaustic painting techniques with artist Ann Shier. 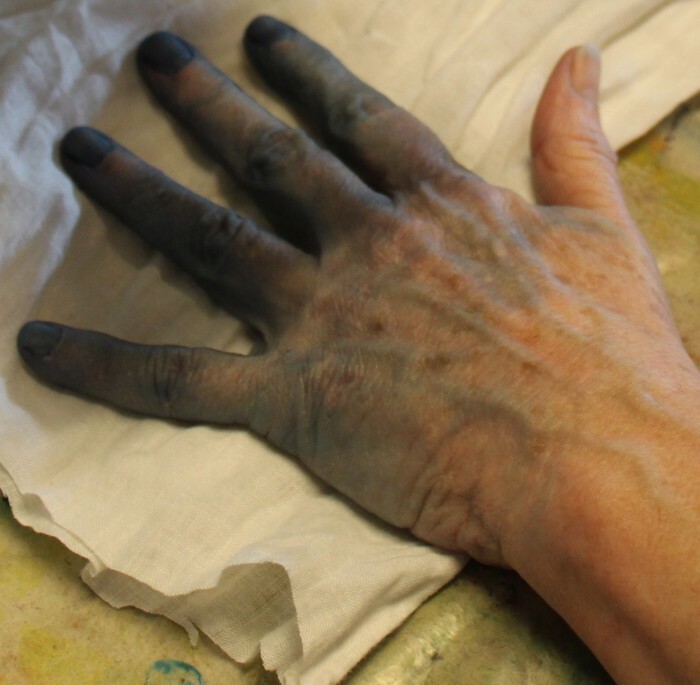 This was a two-day comprehensive encaustic painting workshop. 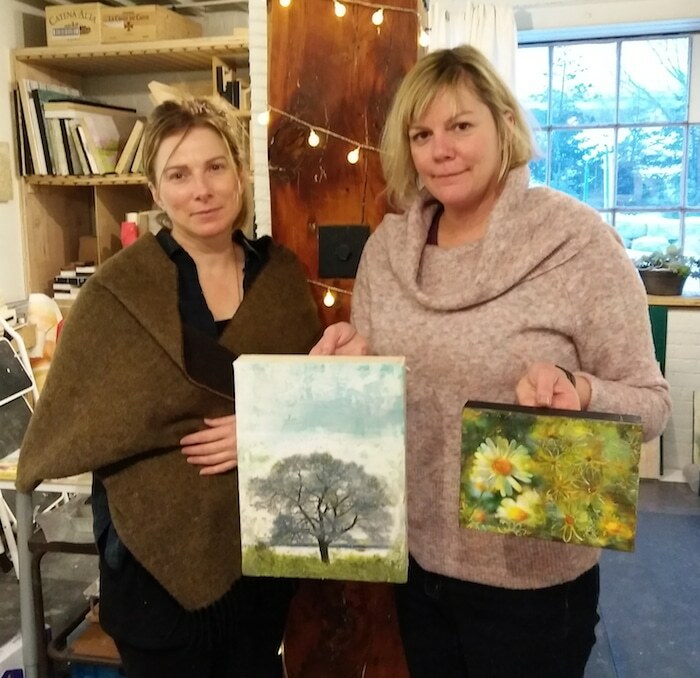 I had taken an introductory encaustic painting workshop with Vashty Hawkins: Introduction to Encaustic Painting Image Transfer Workshop. This small taste, left me wanting to try more. 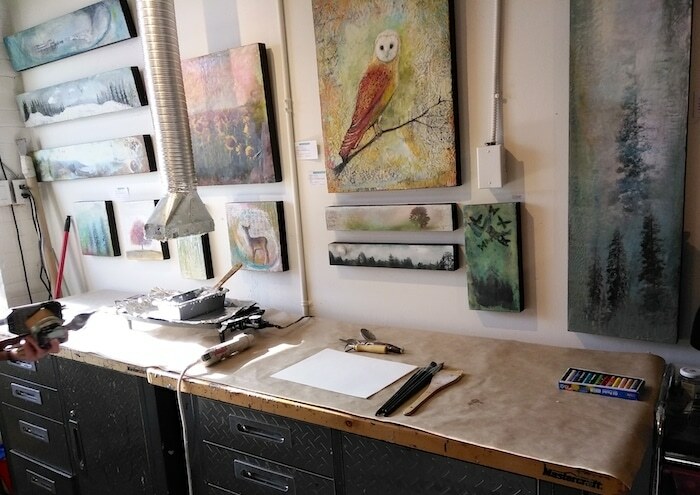 Ann has a great studio space in the Historic Distillery District in Toronto called the Second Door Studio. 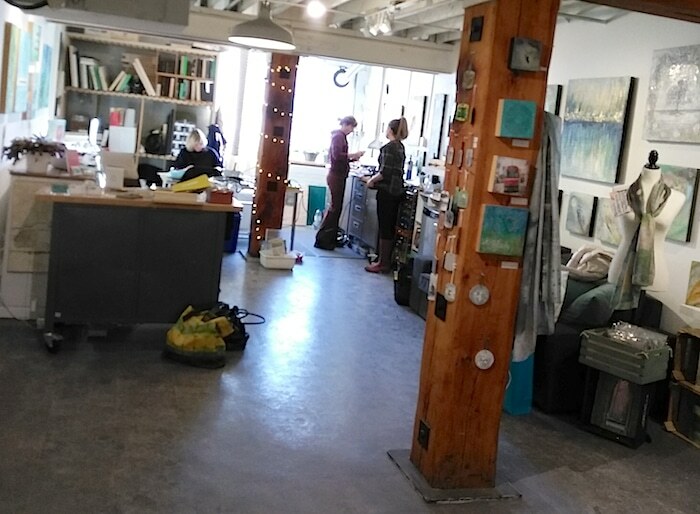 Ann shares this space which is also a gallery and retail shop with artist Joya Paul. 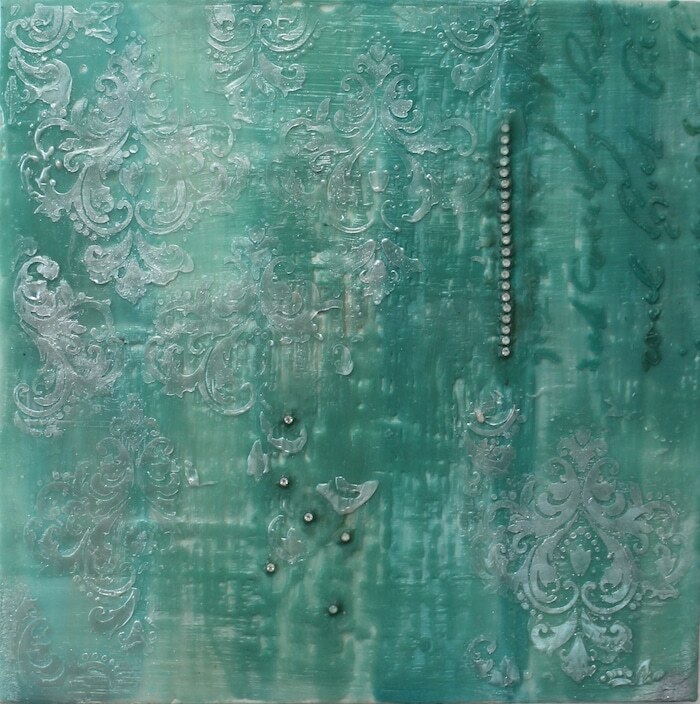 The studio is filled with beautiful pieces of encaustic and mixed media art. There were three students attending the workshop the first day and we each had our own space set up with all the necessary equipment and supplies. We began the day with an overview of the different types of wax, how to mix colours, how to apply the wax medium and how to fuse the layers. We practiced on watercolour paper first. 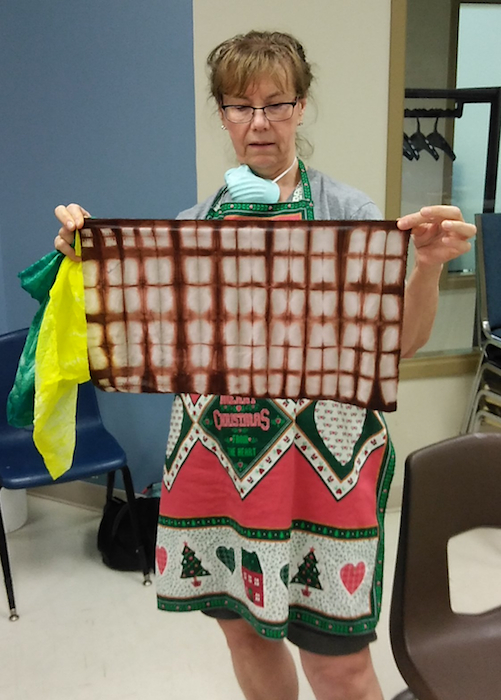 Ann is holding her paper where she demonstrated some of the techniques that can be used in encaustic painting. 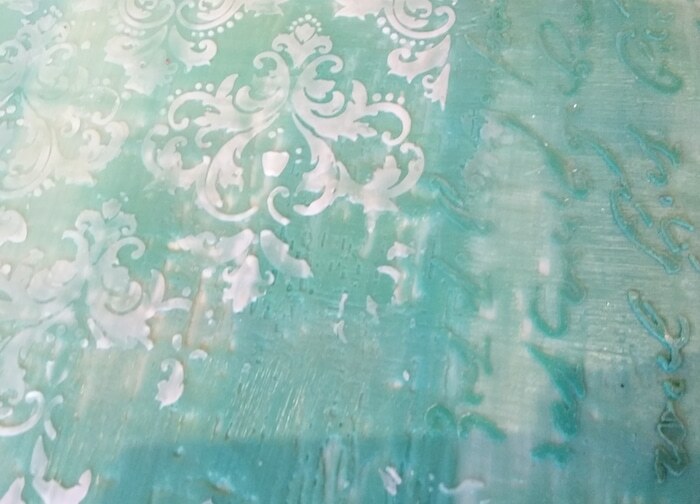 I’ve covered the wooden board with a few layers of encaustic medium I had mixed and am deciding what embellishments to use. 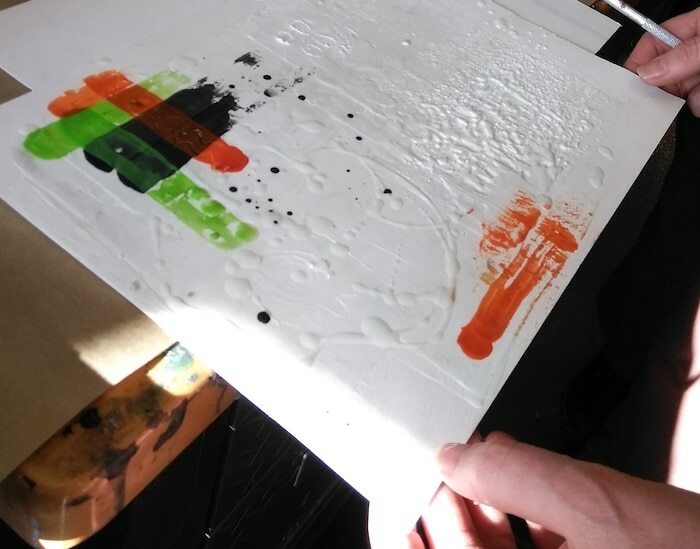 The stencil I chose is covered with a clear layer of wax medium. This shows more stencils added to the right side of the painting before removal. 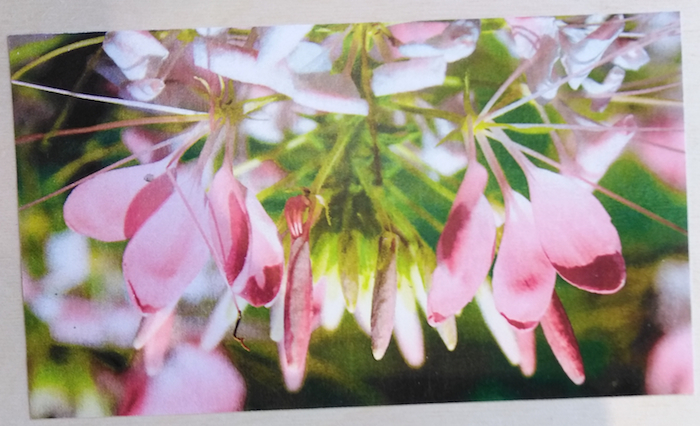 Above, is my photograph of flowers with the colour enhanced and printed on heavier weight paper. This was glued on to a wooden board with archival rice paste and left to dry. 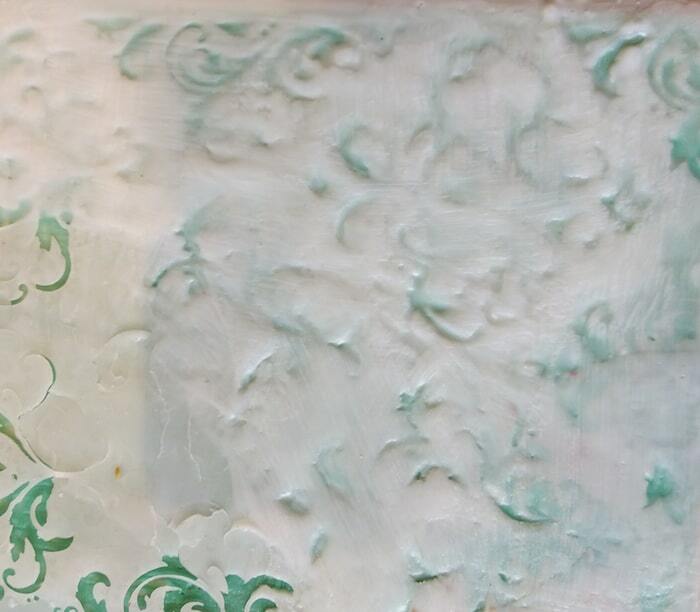 Wax medium is applied in layers to add texture. Pan pastels are added to create depth. 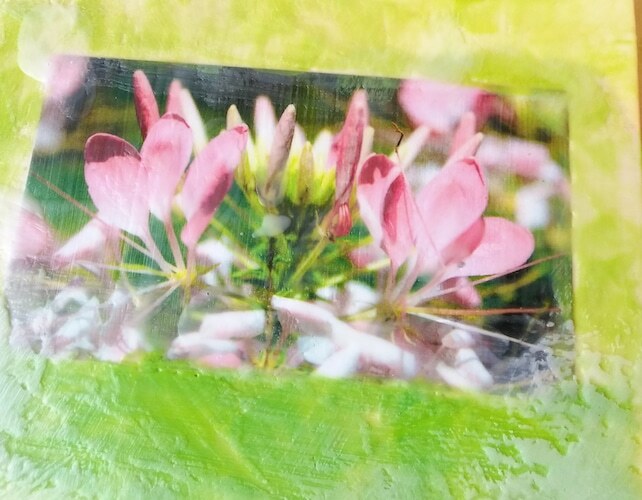 The flower painting is completed! 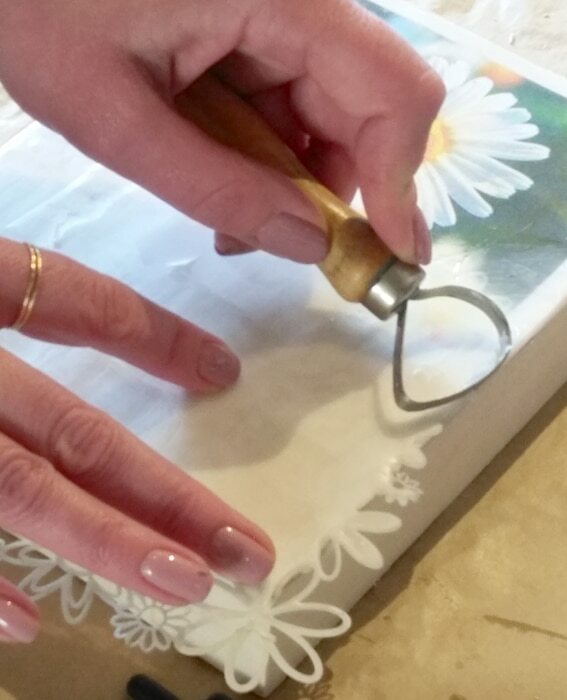 Ann demonstrating how to scrape wax off a stencil. This is Michelle’s beautiful daisy painting. 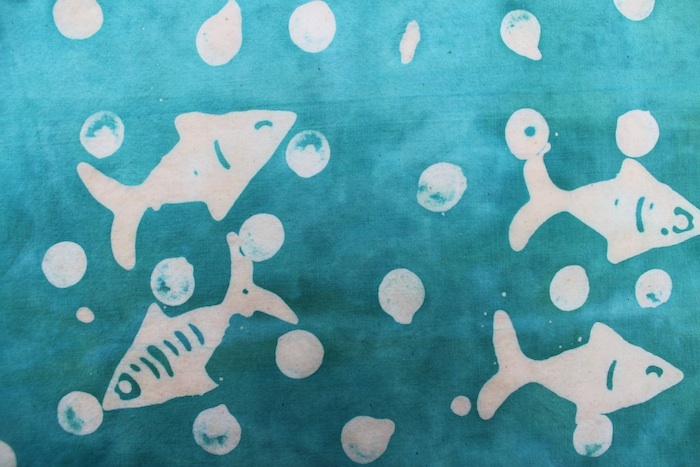 She incorporated photo image transfer, encaustic medium, stencils and pan pastels. 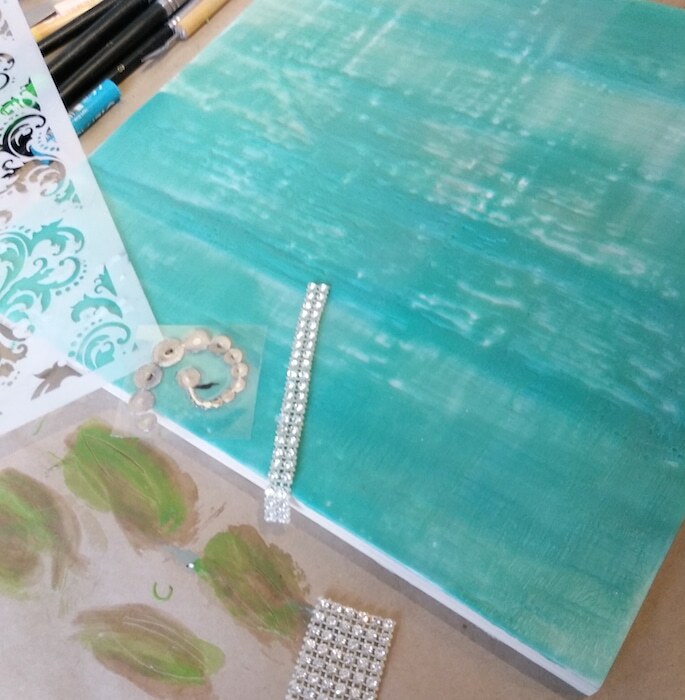 This was her first ever attempt at encaustic painting! 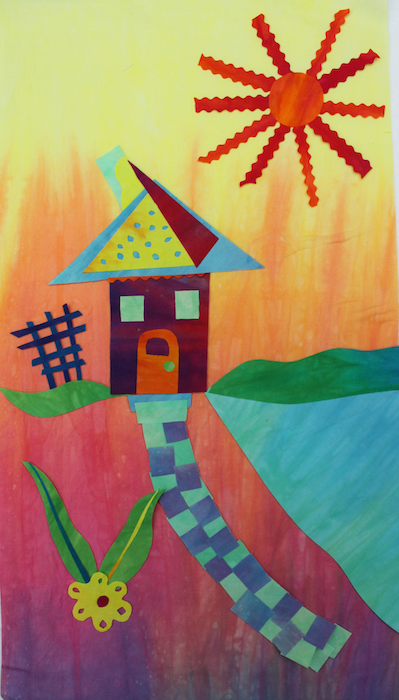 Michelle’s second painting began with her photograph of the tree. 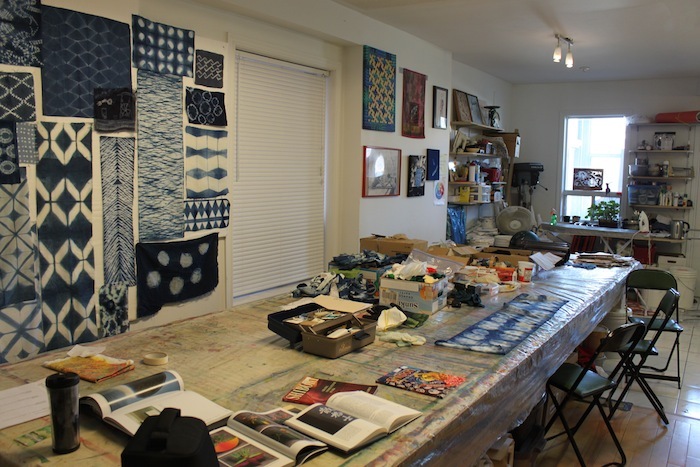 Ann is offering workshops in her studio, visit her website for dates and times. While you are there have a look at more of her gorgeous artwork. 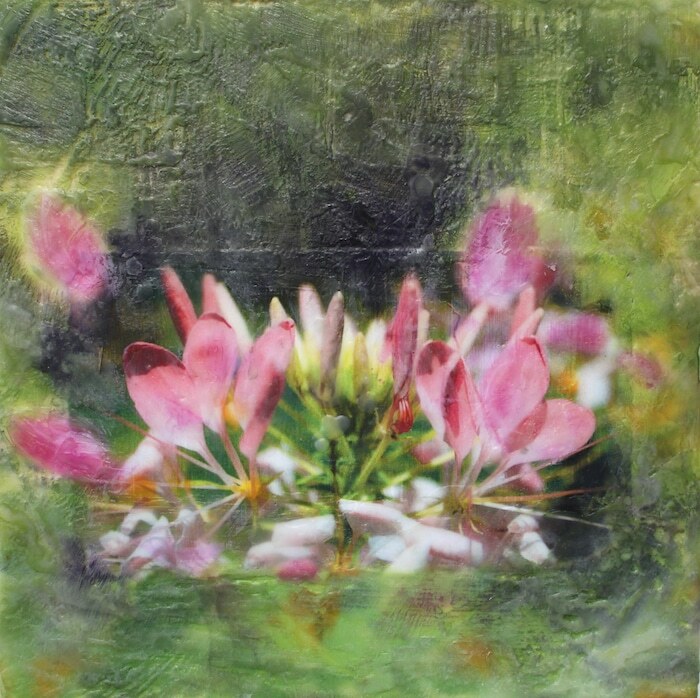 To see more encaustic artwork, visit Wax and Wane : Exploring Encaustic and Cold Wax Paintings at the Twist Gallery, 1100 Queen Street West, Toronto, Ontario, Canada. Eleven local artist are exhibiting their work from Jan. 3-27, 2018. I hope you are able to spend some time this year exploring some new techniques. Have fun and play! 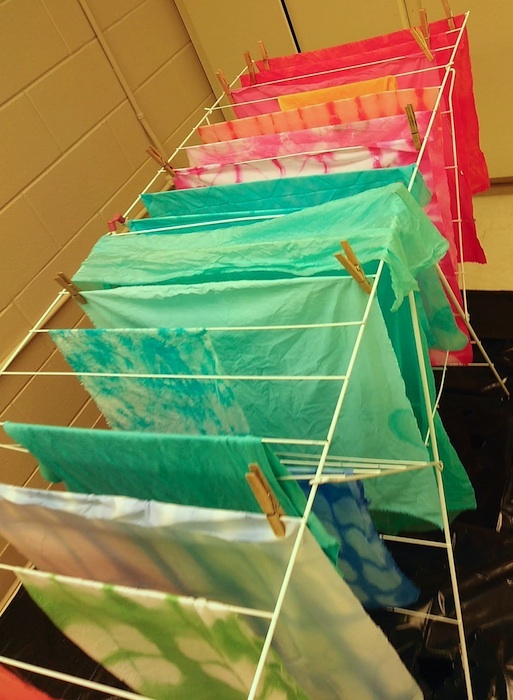 I spent last Saturday teaching an enthusiastic and adventurous group of women hand dyeing with Procion MX dyes. 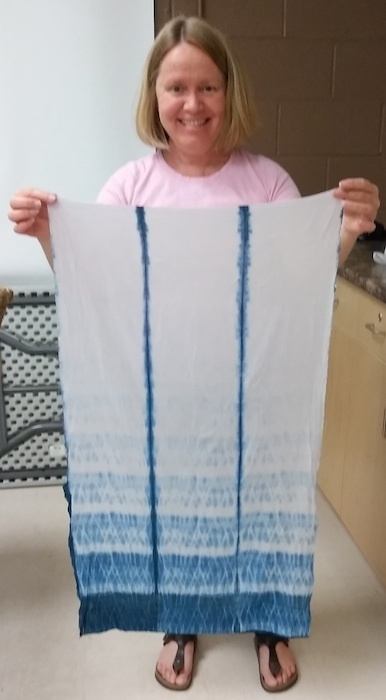 Kristyn of the London Modern Quilt Guild of Canada asked me last year if I would be interested in teaching how I dye fabrics to the guild members. 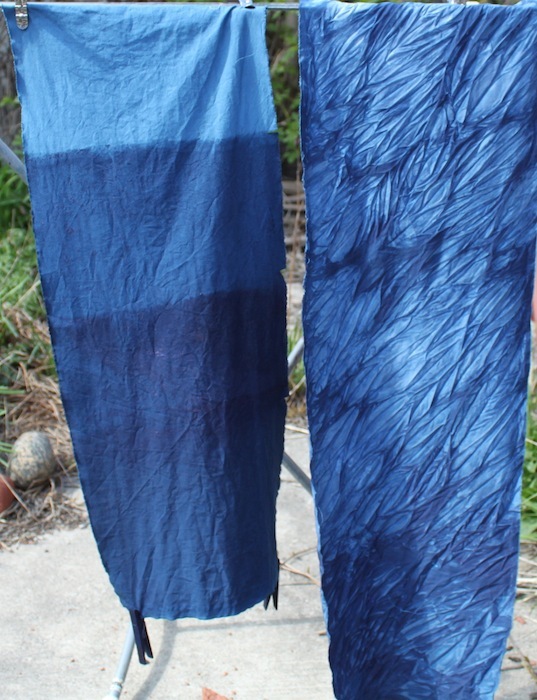 I was excited to be able to share my love of dyeing. 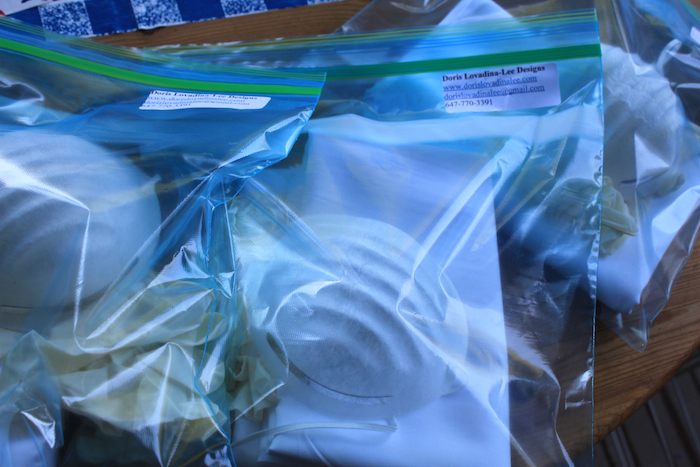 I created kits for all the participants. 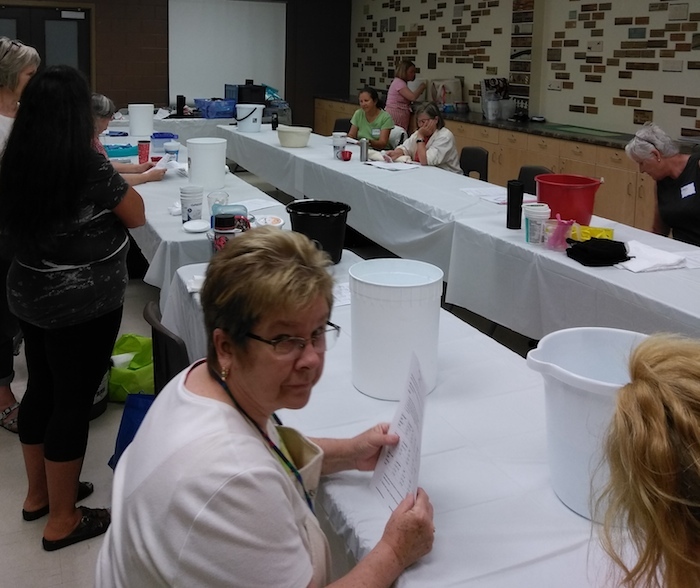 Our group set up in a room in the East Lions Artisans Centre in London, Ontario. It is a great facility with access to plenty of water! 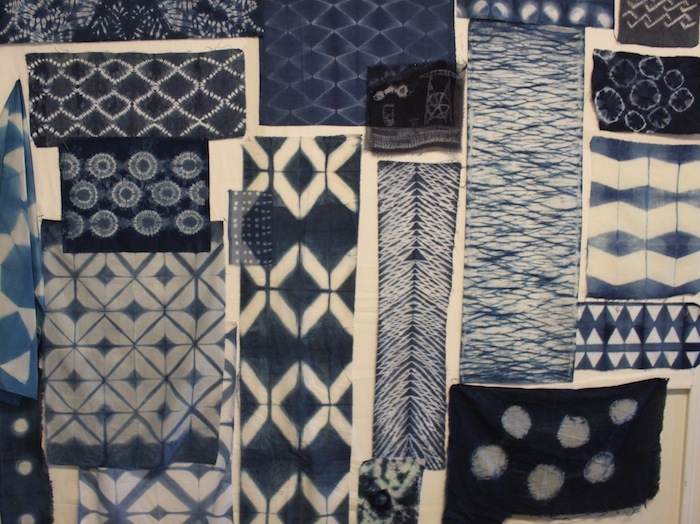 Necessary for any dyeing workshop. 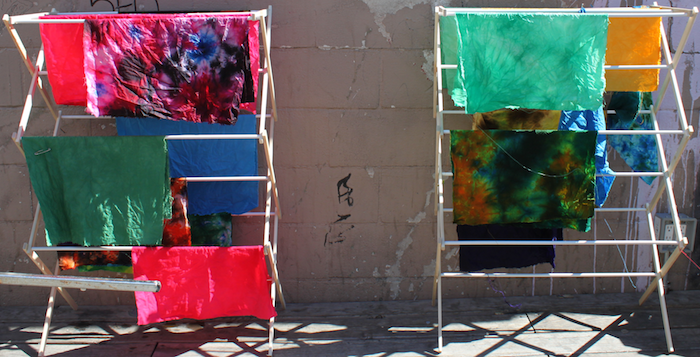 Some of the beautiful and colourful hand dyed fabrics drying. 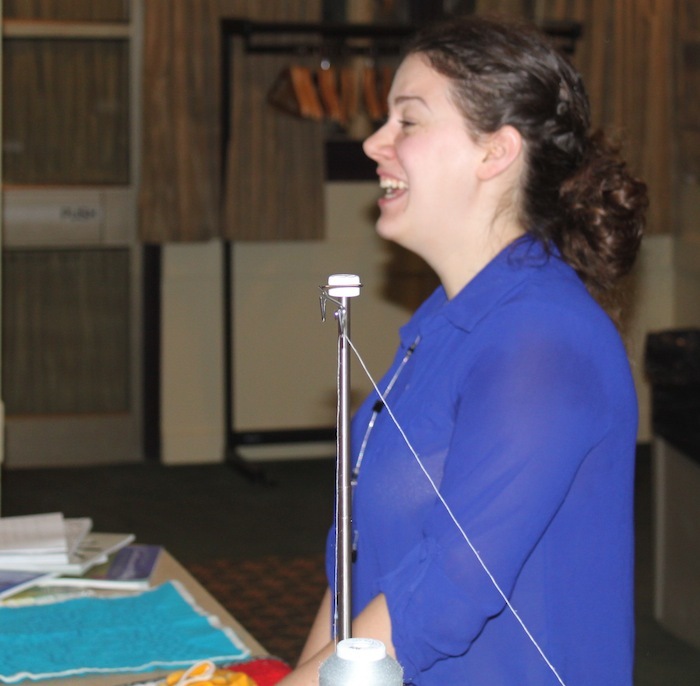 One of the very courageous members @melonpatch.quilts brought cotton yarn. 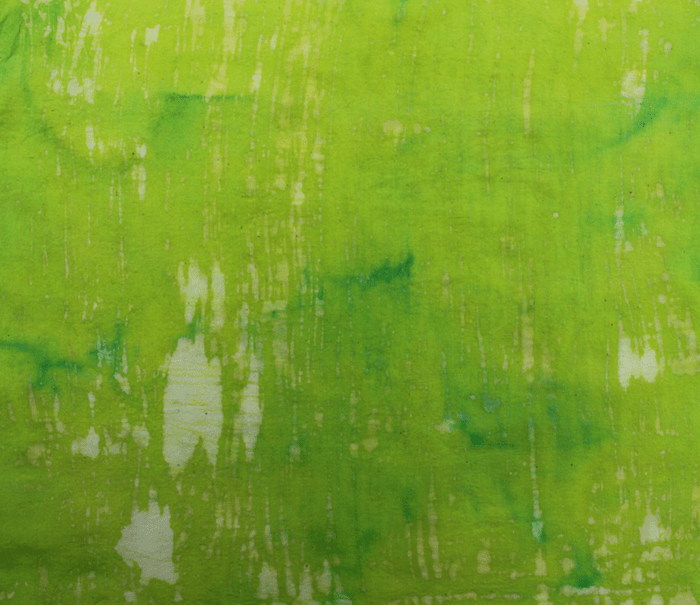 The example above is dyed with olive-green and then sprinkled with black. I can’t wait to see the results. 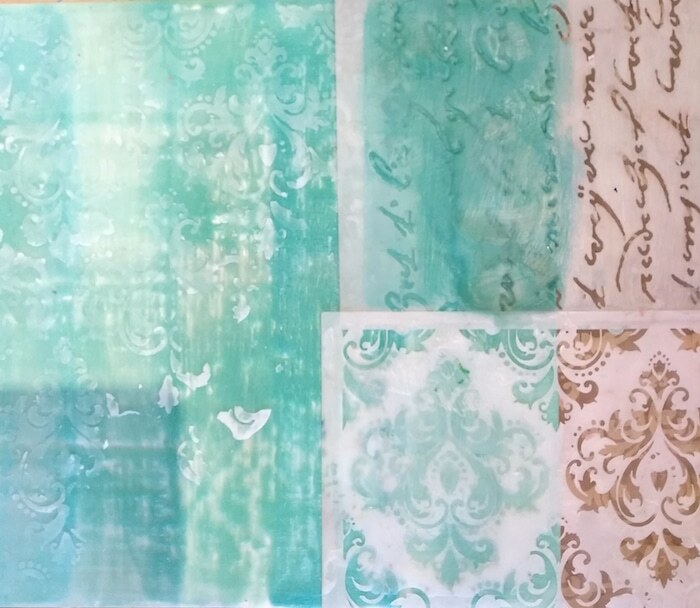 These are just a few of the lovely pieces that the guild members experimented with. 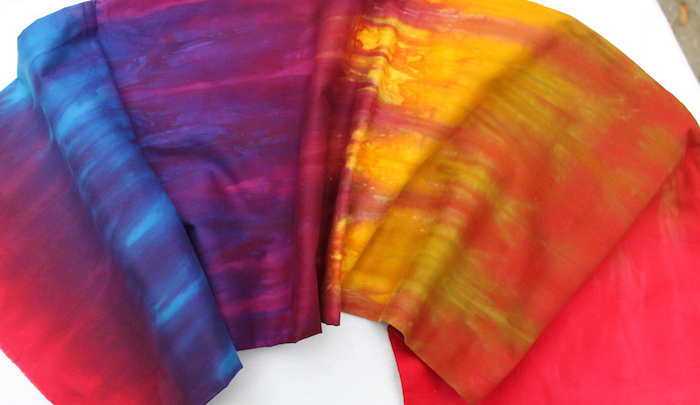 T-shirts, silk scarves, linen, silk noile, a canvas hat, and many pieces of cotton were dyed in a rainbow of colours. 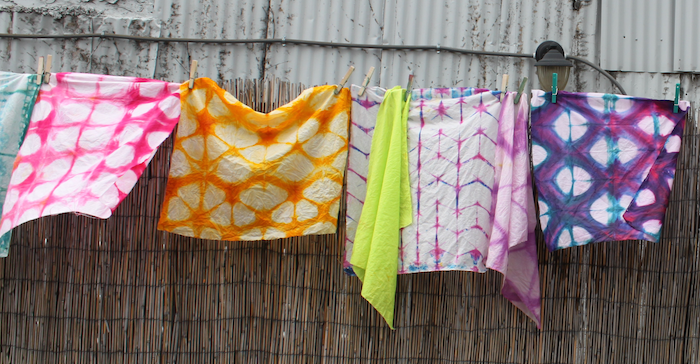 Thank you all for letting me spend the day with you, sharing and creating a rainbow of fabrics. 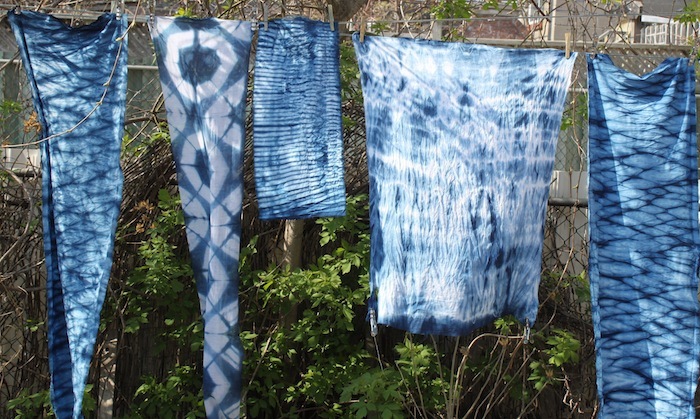 In a couple of weeks I will be travelling to London, Ontario to teach an all day fabric dyeing workshop. 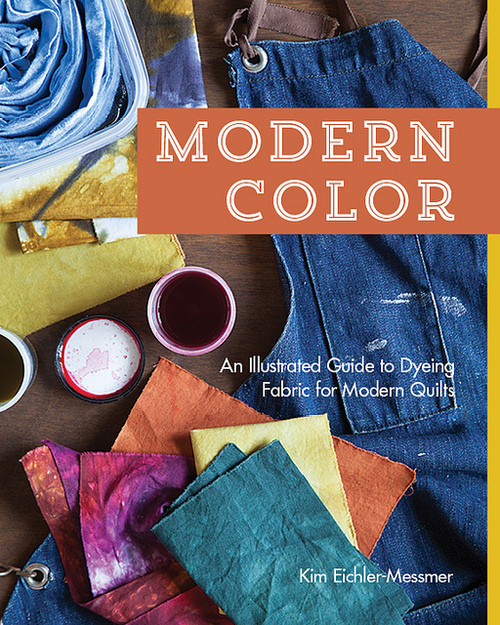 Kristyn McCoy of the London Modern Quilt Guild contacted me last year to ask if I would be interested in sharing my knowledge. I absolutely was! 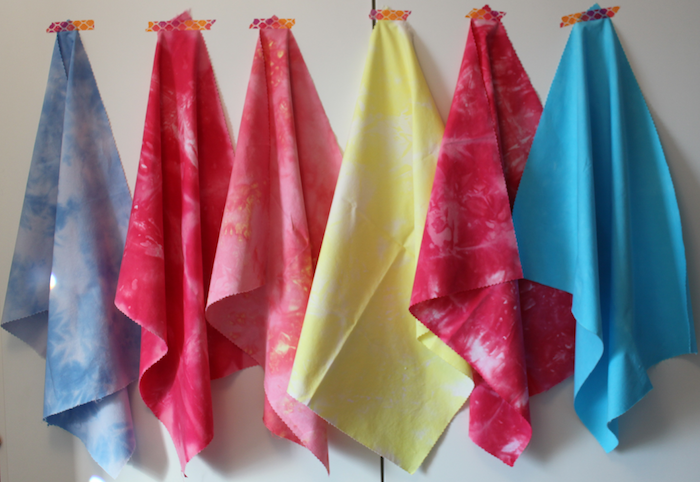 Join me and the members of the London Modern Quilt Guild on Saturday July 8, 2017 from 10am-4pm for a hands on workshop exploring colour, folding, twisting and scrunching fabrics to create your own original hand dyed fabrics. Information is available on the Events page. 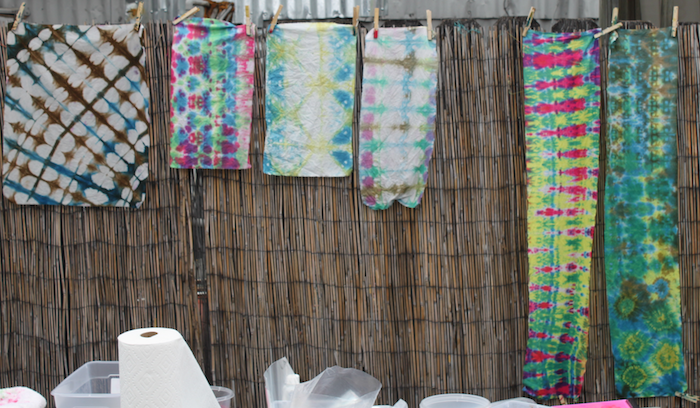 I spent an inspirational day with Amy Garro of 13 Spools. 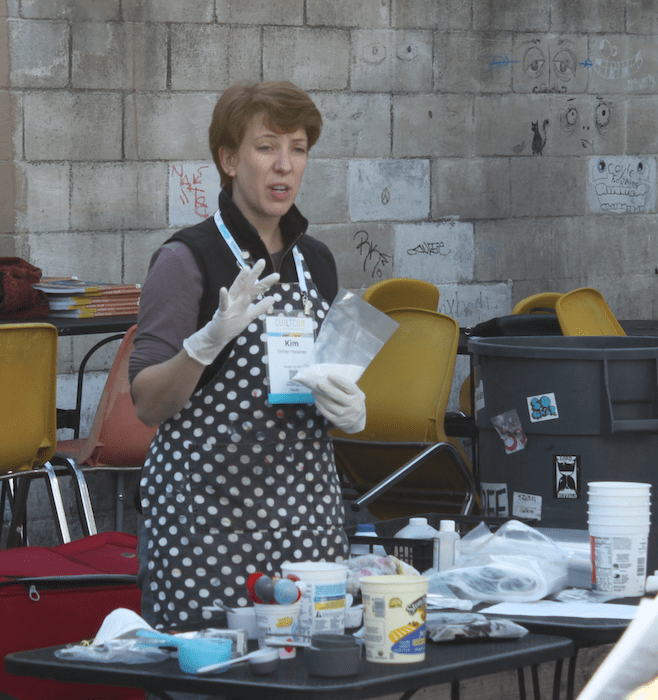 She taught her workshop on Graffiti quilting to a group of very enthusiastic quilters. The workshop was well planned with lots of useful information. First we practiced the motifs by doodling on paper, then on the sewing machine. 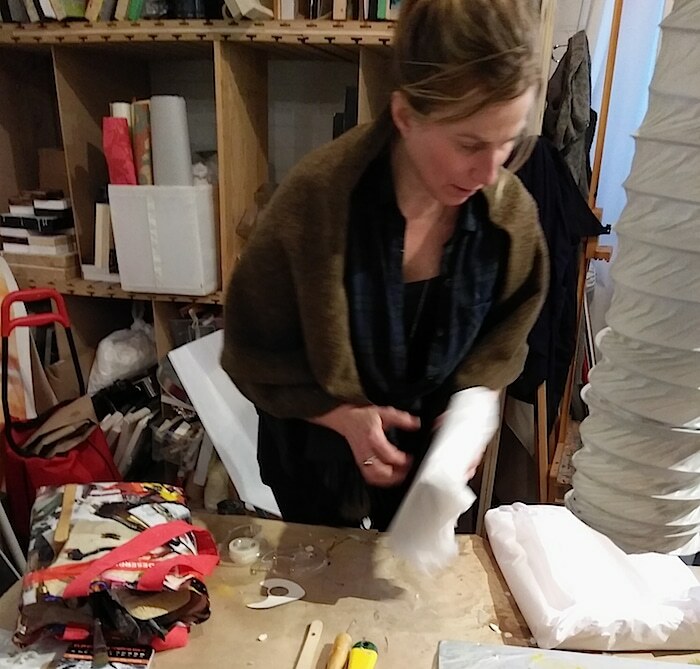 It was helpful to see Amy practice her technique and also to hear her thought processes when she decides on her designs. 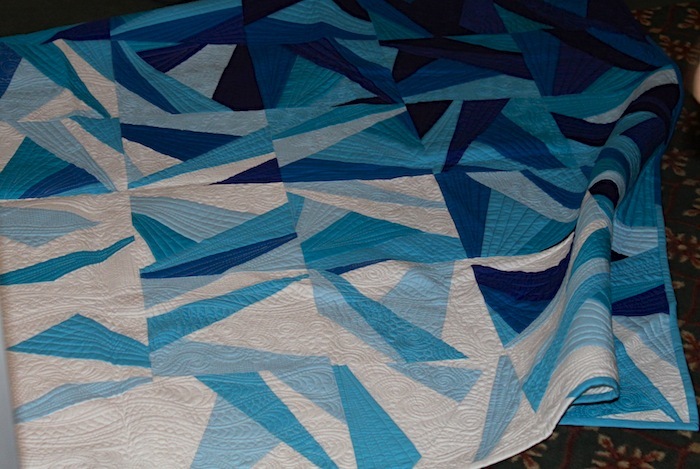 Amy brought a selection of her quilts including the Icy Waters quilt pictured above. 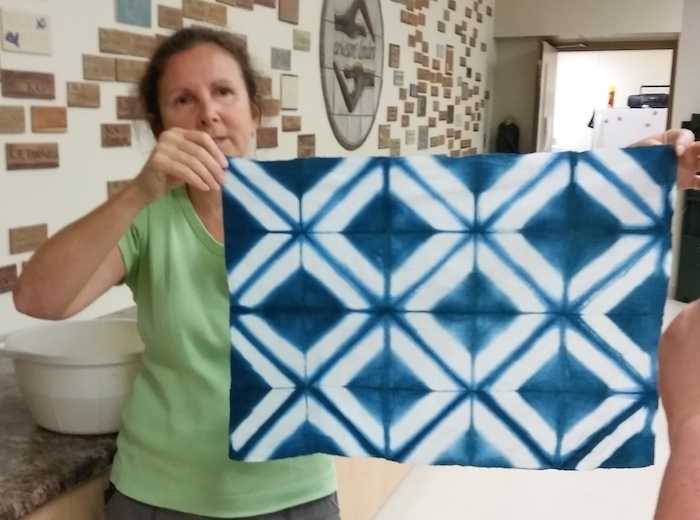 I was happy to hear that her aim in quilting is not perfection. 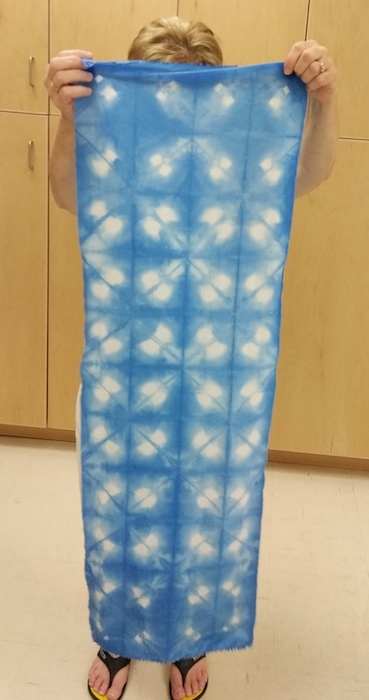 A few of us brought quilt tops that needed to be quilted but we were having trouble deciding on a quilt design. Amy asked what we liked most about our quilt – the precise piecing or the colour combination or the interaction of the blocks. 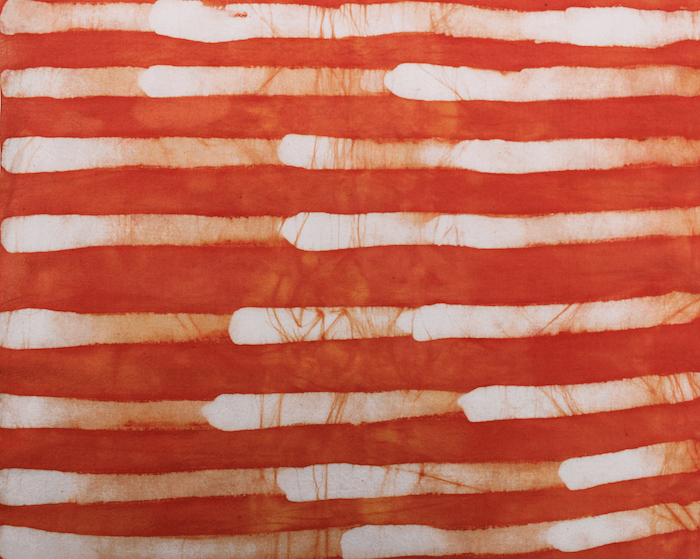 With this in mind, select a quilting design that makes this a feature of the quilt. I’ve begun the quilting on a piece that I’ve had on the design wall for some time. 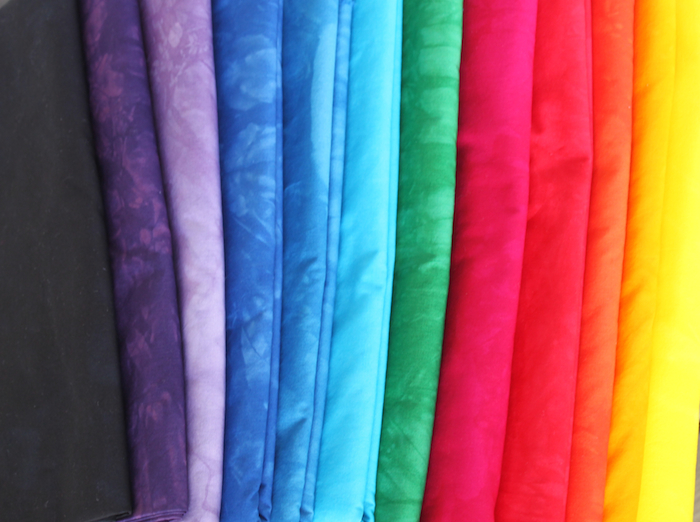 How do you decide on your quilting? 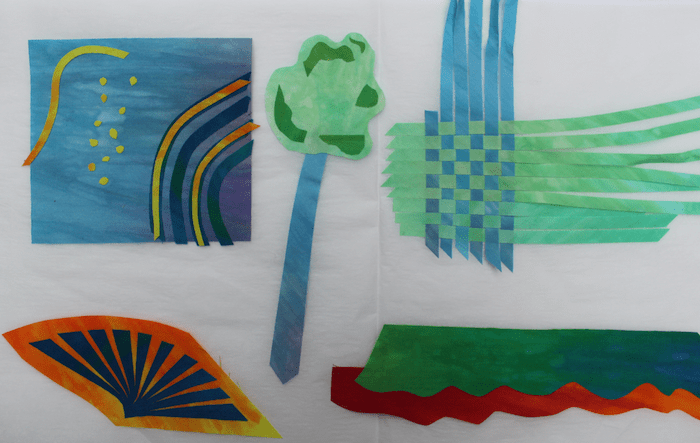 On the second day of the workshop we were back early with stitched pieces of fabric ready to dye! 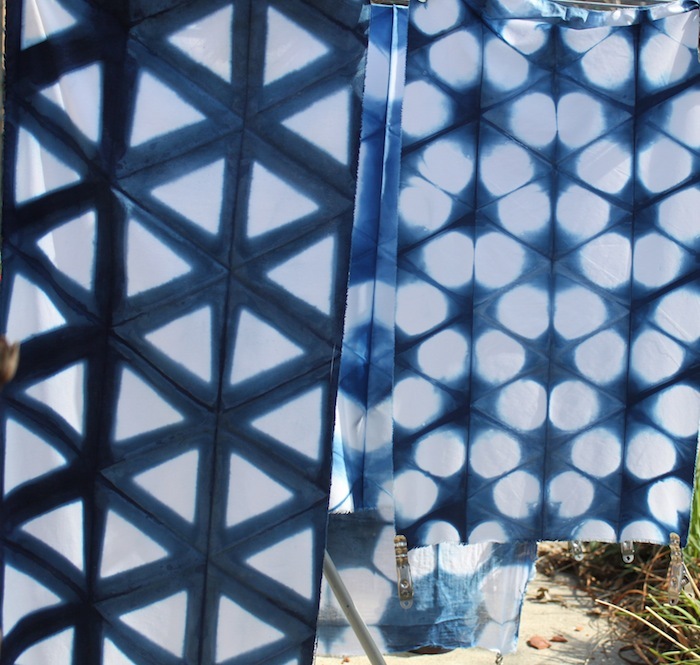 Preparing the fabric was time consuming but the results were fantastic! 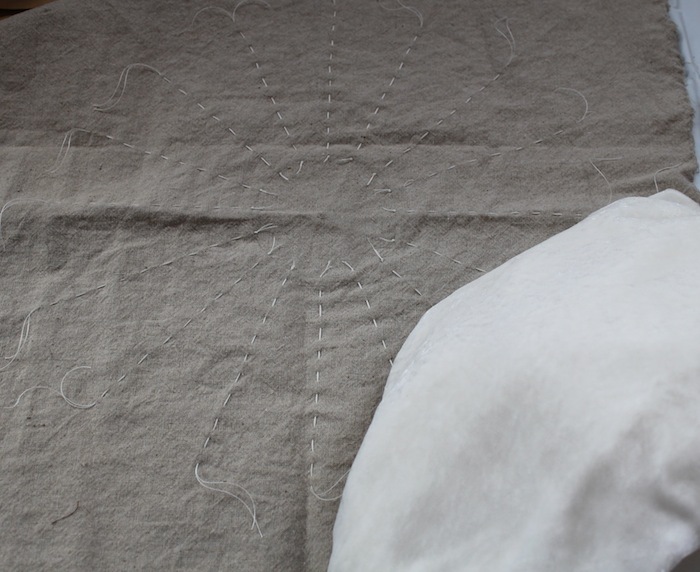 The beige fabric is a linen/cotton blend that will become a pillow. It is basted from the center out with upholstery thread and running stitches. The other beige piece has the fabric pulled through metal washers. 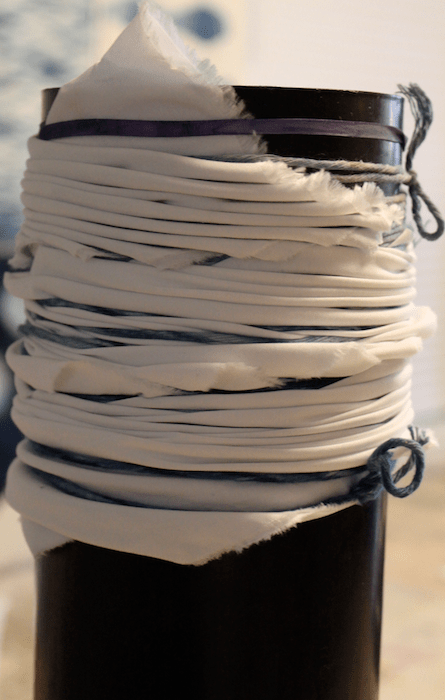 The white cotton on the lower left has small plastic bead wrapped inside and tied with thread. 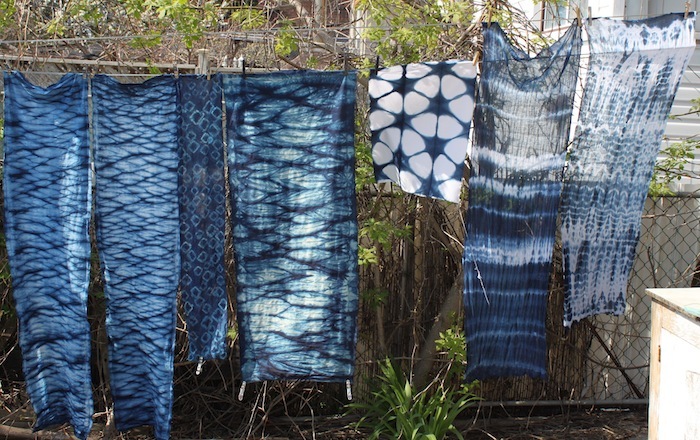 Shibori designs are created when the fabric resists the indigo dye. 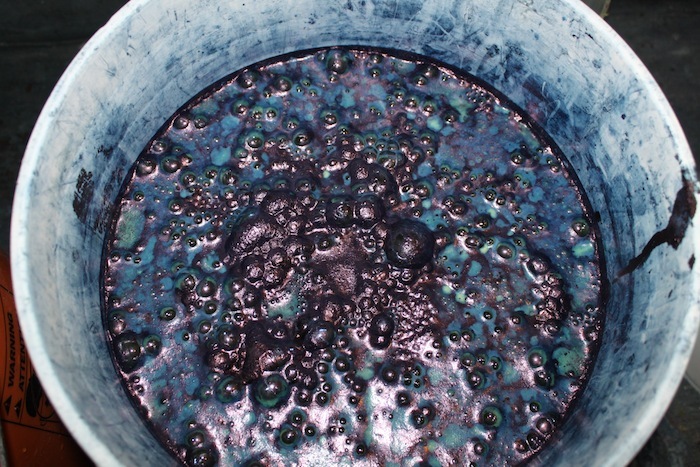 This is achieved by creating portions of the cloth where the dye can’t penetrate. So, the tighter that fabric is gathered, clamped or stitched, the more it retains its original colour in these areas. Above, on the left is a PFD cotton that was folded in half lengthwise and then pole wrapped. 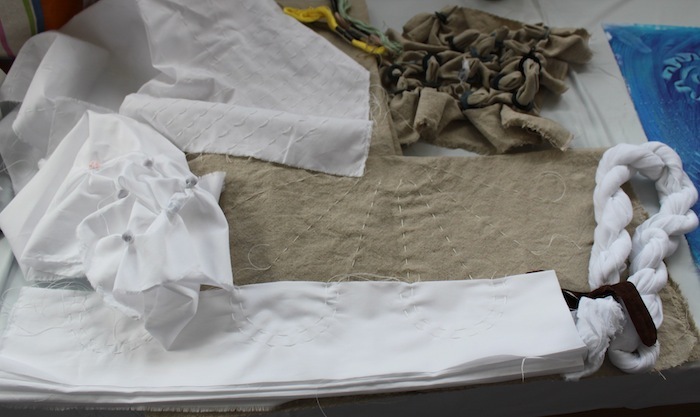 The cotton gauze on the right was folded into squares and clamped in-between two pieces of wood. Each time I unwrapped a piece, more design possibilities were suggested. 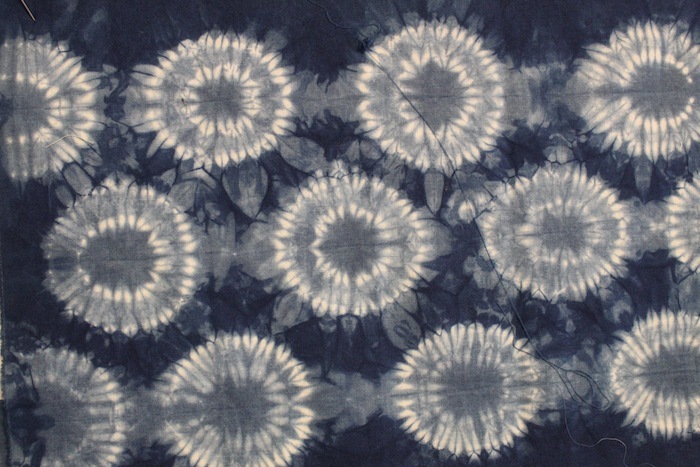 I would like to experiment with different weights and textures of fabric as well as silk and pure linen. 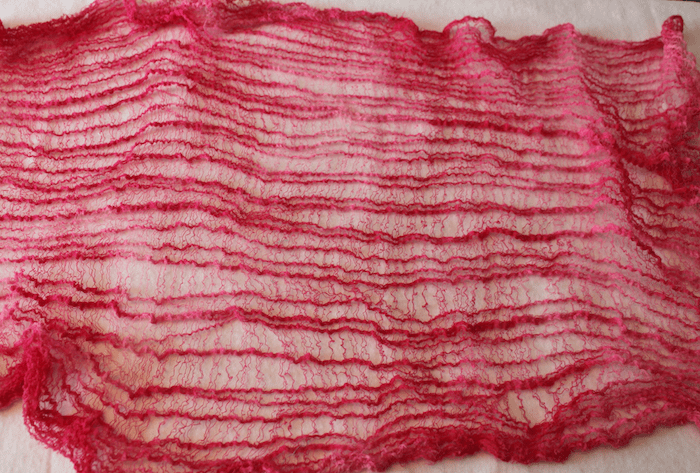 I think that the differing weaves of the fabric will also contribute to the uniqueness of the finished designs. 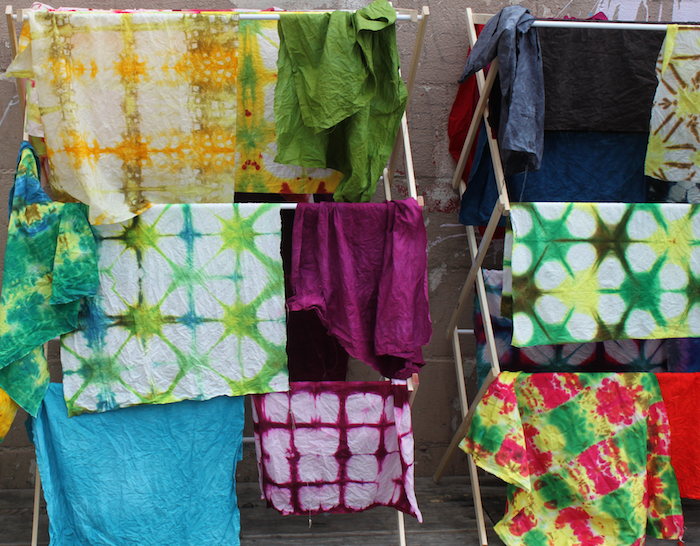 There are more pieces waiting to be washed and ironed. 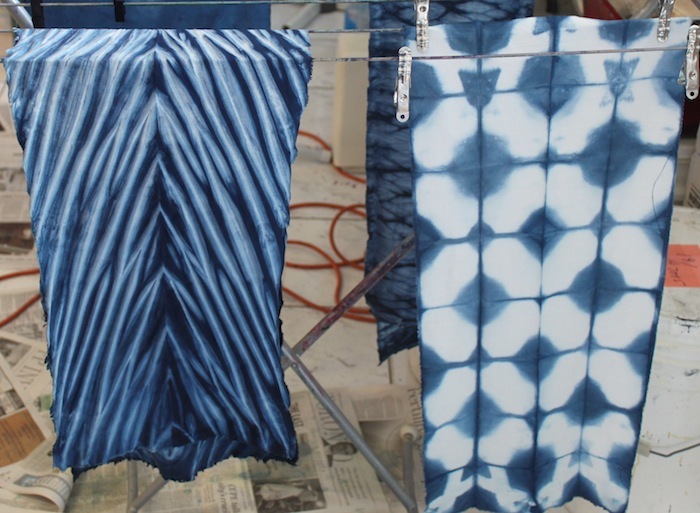 I enjoyed creating the varied styles using the shibori technique and will try them out using Procion fabric dyes during the summer. 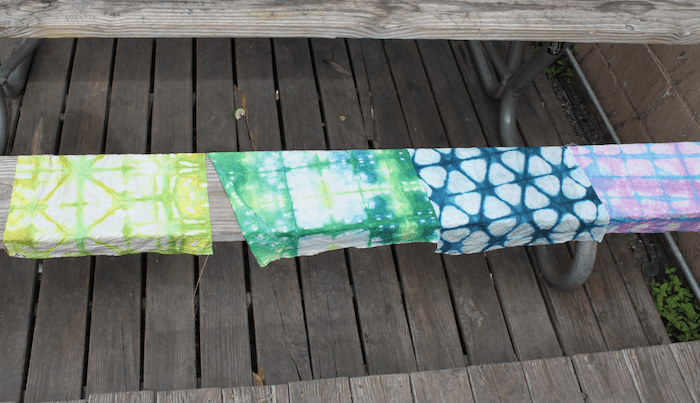 The fabric on the right looks like daisies! 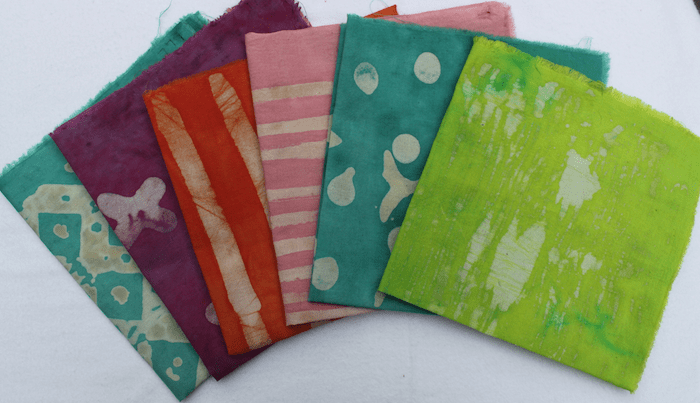 These fat quarters were dyed using extra dyes left over from another project I worked on in the fall. 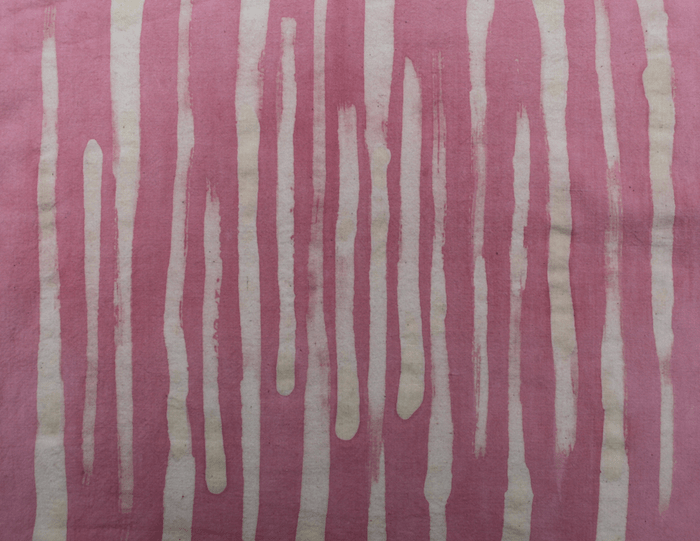 It had been a while since the dyes were mixed and I wasn’t certain how the fabric would take the dye. 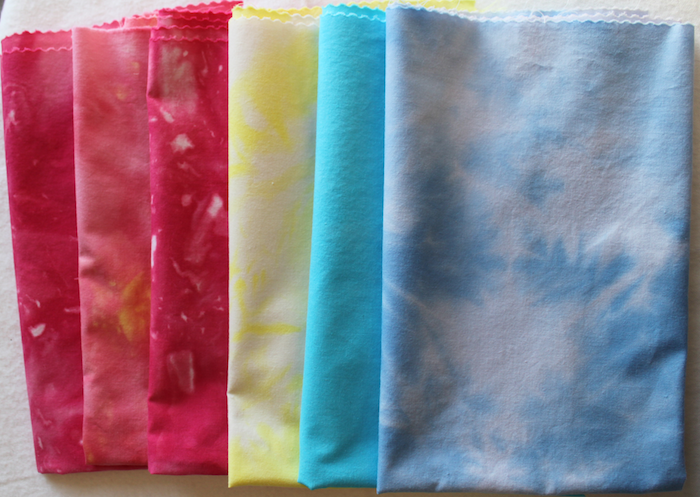 I selected 6 pieces of PFD (prepared for dyeing) fabric and put them in the dye baths with no expectations. These are the results. My favourite piece is third from the left below. 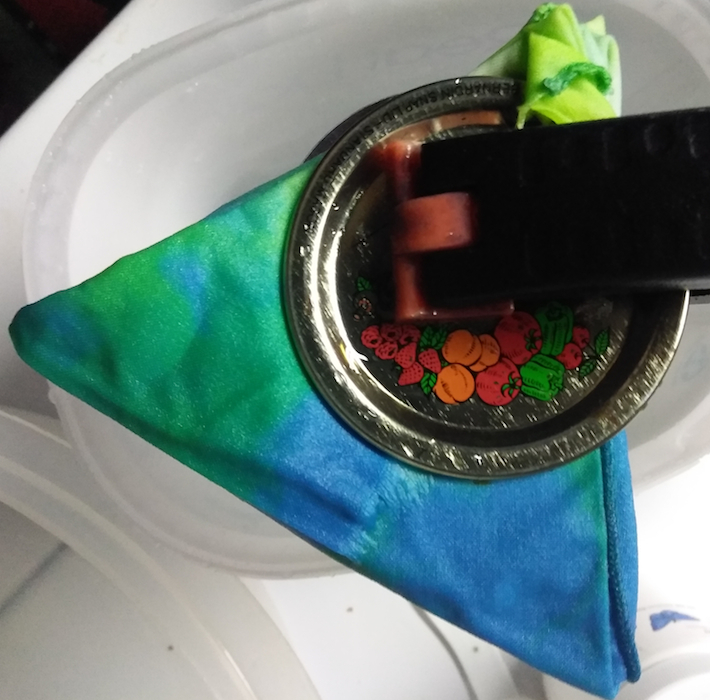 Both red and yellow dye were added to the container. 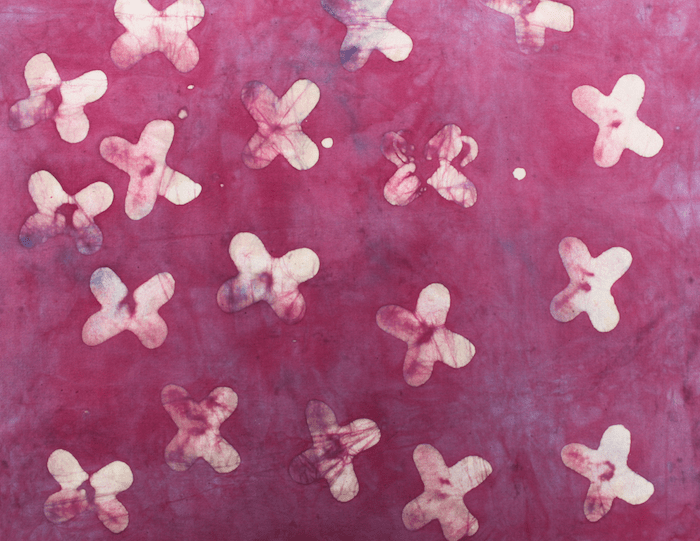 The result is a watermelon pink with some yellow areas. 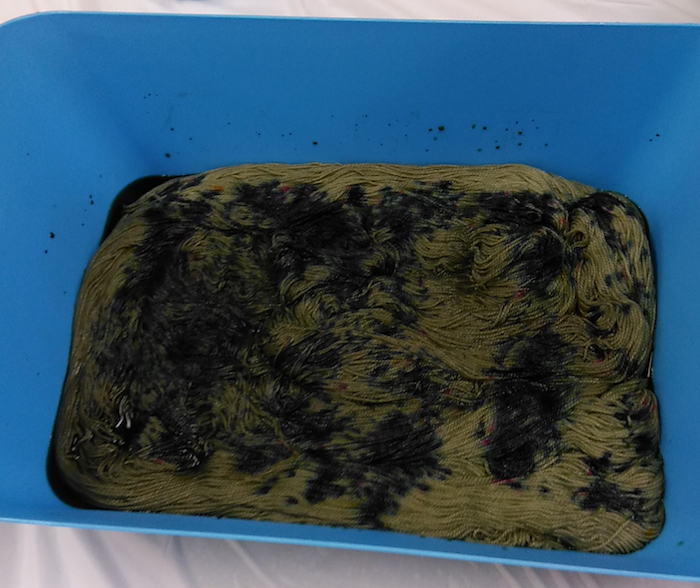 The biggest surprise from the dye bath is the piece on the left. 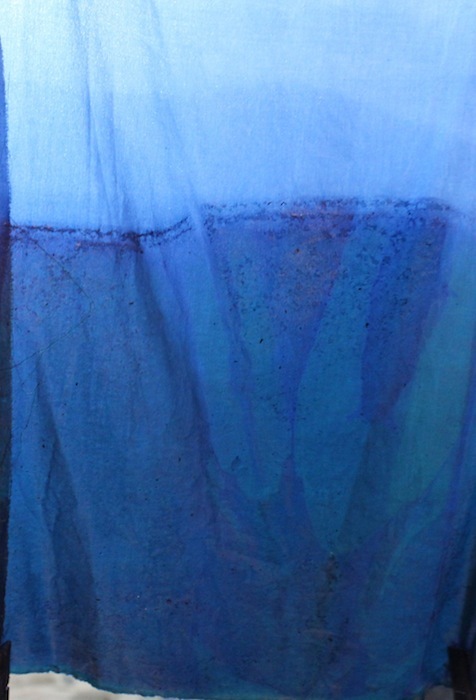 In the container it was a deep intense blue, after rinsing out the excess dye, the blue looks like a patch of frozen ice. 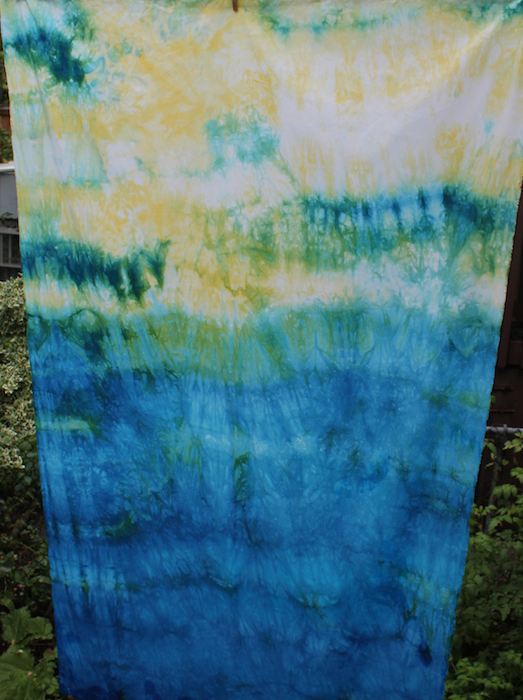 I also dyed a piece of cheesecloth and am pleased with the colour and look of it. There is a lovely variation in the colour and the texture is scrumptious too! 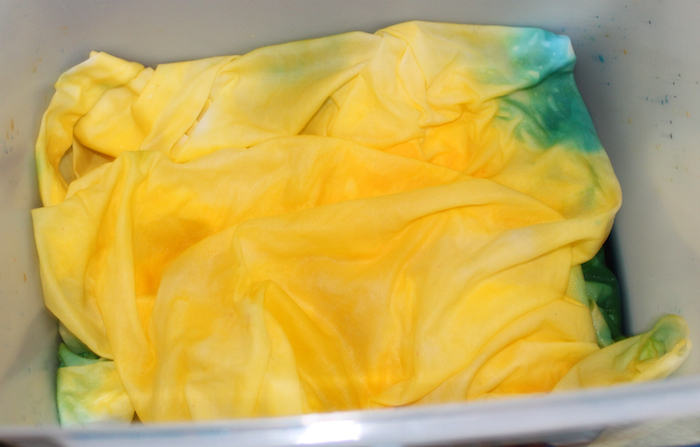 I have a piece of silk velvet that is waiting to be dyed. 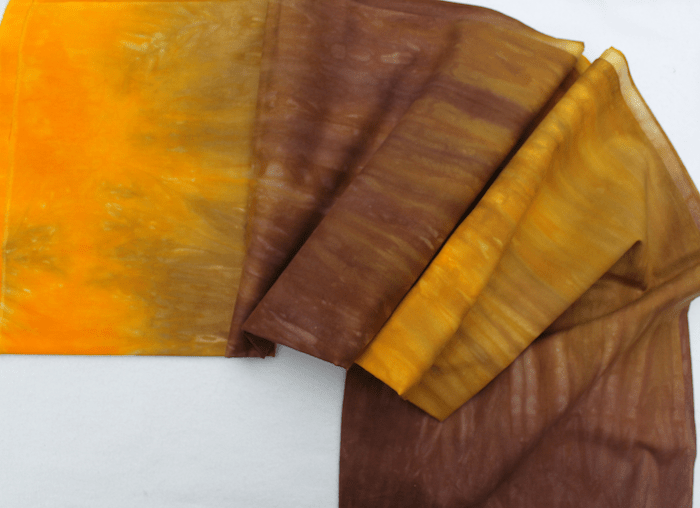 I used hand dyed velvet, that I purchased, in the Icterine series and love the texture it gives to a piece. 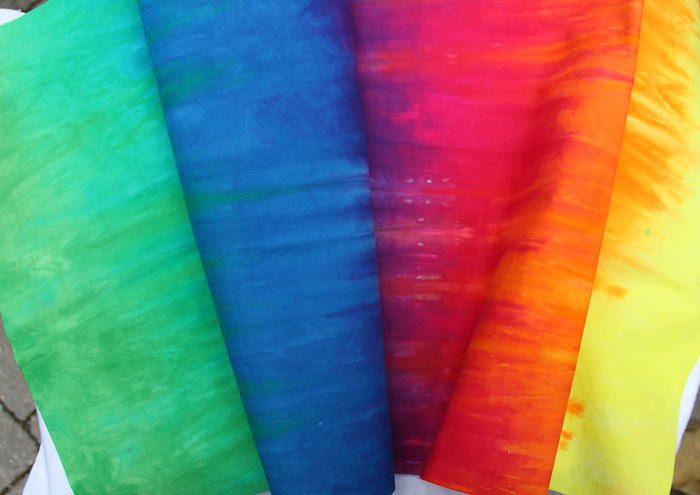 I haven’t decided what colour I want my velvet to be yet! 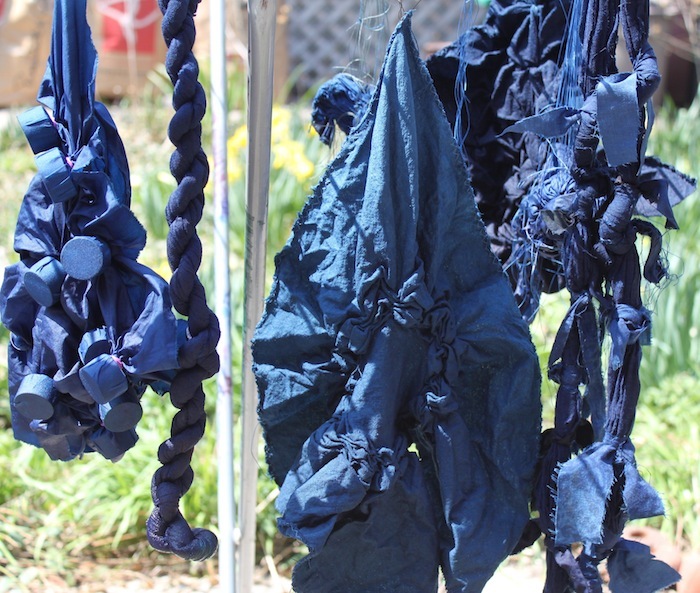 What types of fabric have you tried dyeing?